The Deal: Order now- Sizes Will Sell Out quickly (again) +Prices may rise when sales goals are met. Warning: Order now to lock in current sale price/ selection. We negotiated with factory to keep prices low for now, May be higher later. The Process: When you order, your card will be billed for the full amount. You then get an auto-email the next business day. Fri/Sat/Sun orders get an email on Monday. Weekends/Holidays are not counted as "days". Faster than a Hybrid or Comfort bike, more durable than a Road Bike! What is it? It's an Adventure Hybrid Bike!! These are like road bikes with trail capable tires, flat bars and high-rise stems. More comfort and control than a regular road bike. 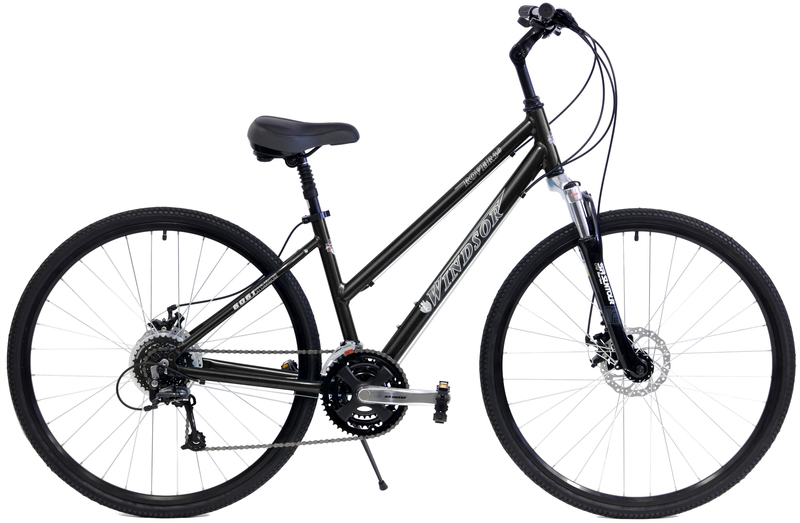 Greater capability than a hybrid bike with wider tires and performance geometry. 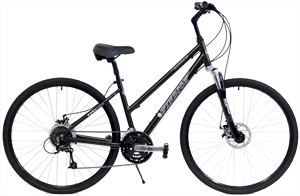 Adventure Hybrids tackle virtually anything on a bike path, dirt road or groomed trail system. 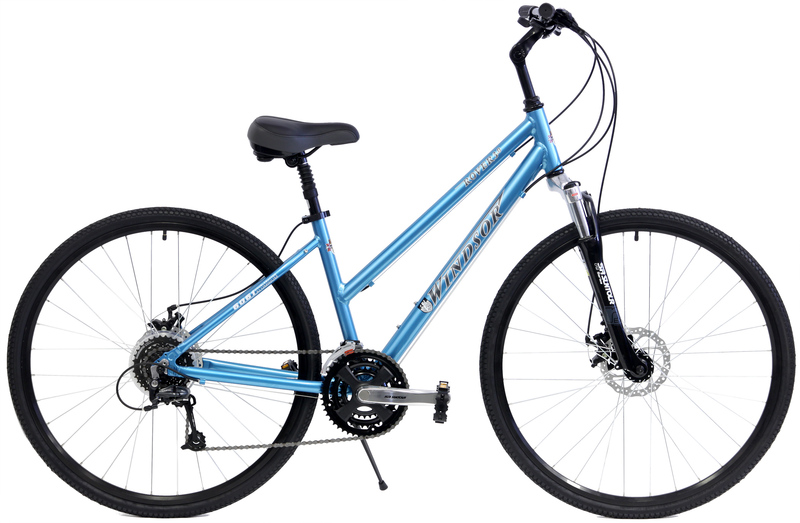 24-speed Shimano Deore, Powerful Disc Brakes, Suspension seatpost, Suntour suspension fork and Shimano Cranks and Shimano Trigger Shifters. Super comfortable Bumper Saddle. This special saddle has it's own suspension that supports the rider and absorbs the rumble of most road vibrations. These Rover Hybrid Adventure bikes are Lightweight, High Speed AND Comfort. Super-efficient 700c tires, Shimano components and geometry with the most comfy upright position. How can you go wrong? 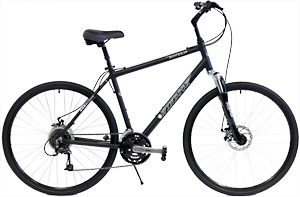 These are the perfect bikes to comfortably cruise neighborhoods or bike paths. 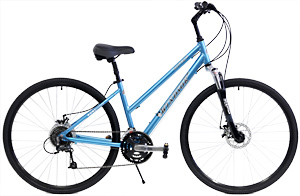 These great bikes are also available in a Ladies frame which have a special lowered top tube/bar for a shorter step-over, straddle height. Finely Hand Crafted frame of lightweight and strong aluminum and outfitted with some of the best brands of parts in the world! Shimano, KMC, Kalloy, Tektro, Kenda and Suntour. Now On SALE $379 Save OVER $500 off MSRP! Up to 60% Off - While they Last! VP-893N PLASTIC BLACK W/CPSC REFLECTOR / KMC	Z-72	1/2"*3/32"
When you need and want the best all around bike, the Windsor Rover shines brightly.